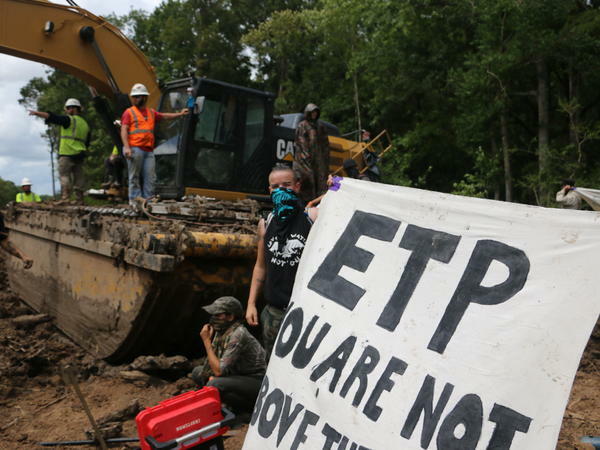 Protesters disrupt construction of the Bayou Bridge Pipeline in early September. Trespassing near pipelines is now a felony offense in Louisiana, punishable by up to five years in prison. 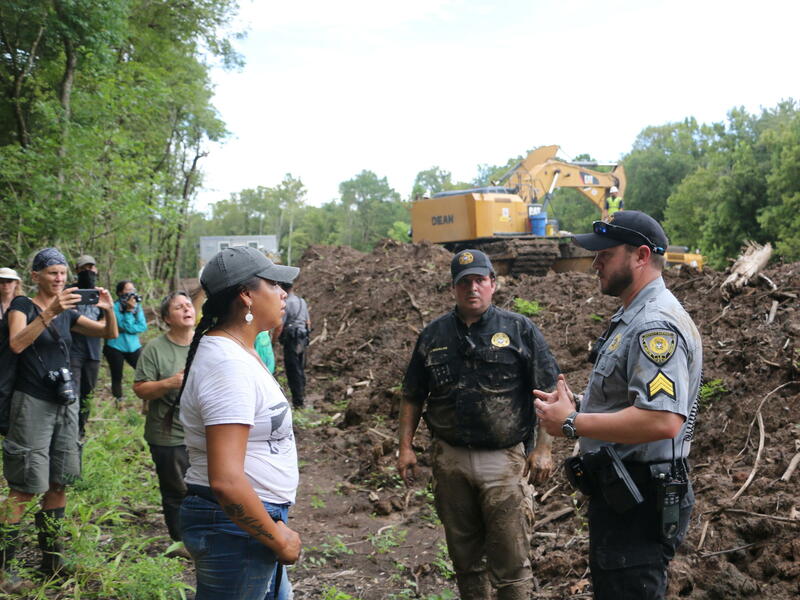 Sheriff's deputies negotiate with protesters who have disrupted construction of the Bayou Bridge Pipeline. No arrests were made on this day, but at least 10 protesters could face felony charges. The controversy here is over the Bayou Bridge Pipeline, the last leg of the Dakota Access. If completed, it will bring crude oil from the Bakken oil fields of North Dakota, through Louisiana, where it will be exported abroad. On a recent day, deep in the Atchafalaya swamp of South Louisiana, twigs snap under the rubber boots of about 40 protesters as they march through shaded woods. Many have tied bandannas around their faces, leaving only their eyes exposed. In the distance, backhoes fling mud as construction workers clear a path for the new Bayou Bridge Pipeline. "Y'all are trespassing!" a construction worker shouts. "Go home!" a protester yells back. After a few minutes, the construction workers shut off their equipment and the protesters celebrate. But later, things get heated after the sheriff's department shows up. A deputy pins one woman to the ground, and the two sides engage in a muddy tug of war until she tumbles free. It's incidents like this that have helped push lawmakers to take action. Earlier this year, Louisiana state Rep. Major Thibaut proposed a bill with stricter penalties for pipeline protesters. "You know that there's a right way to do things and a wrong way," Thibaut told a state legislative committee. "And if you want to protest against something ... get your permit and you go do it in a legal fashion." Trespassing in Louisiana is normally a misdemeanor offense. But the new law deems oil and gas pipelines to be "critical infrastructure," a classification that includes places like nuclear plants, oil refineries and water treatment facilities. As of Aug. 1, trespassing near oil and gas pipelines in the state is now a felony offense, with a possible sentence of up to five years in prison. Several states have either passed or are considering similar laws, including Oklahoma, Iowa and Pennsylvania. The oil and gas industry is a big part of many states' economies, including Louisiana. Craig Stevens, who represents pipeline interests with Grow America's Infrastructure Now, says these new laws will help ensure pipelines are not delayed and will also help keep both workers and protesters safe. "It wasn't too long ago when there were, I think, four protesters that broke through and tried to penetrate, and actually did pierce a pipeline up in the Midwest," he says. "And they used blowtorches. I mean that's the type of thing could actually explode and kill somebody." There were two such cases, and in both the pipelines were empty at the time. Pipeline opponents say more than 10 people have been arrested under Louisiana's stricter law. Journalist Karen Savage captured the first arrests on video, which shows several security officers pulling three protesters from kayaks onto an airboat. Those arrested said they didn't think they were doing anything illegal since they were on water, which is considered public property. "It's a ridiculous over-criminalization of people who protest," says Bill Quigley, a law professor at Loyola University in New Orleans who represents protesters here and in other states. Quigley calls the new law unconstitutional on First Amendment grounds, and he says he plans to challenge it in court. He hopes doing so will encourage other states to walk back their own laws. So far, it's not clear whether the local district attorney will prosecute those charged with felonies. But at the Bayou Bridge protest, anti-pipeline organizer Cherri Foytlin says she and others won't be deterred. "I hope to God no more felonies," she says. "But if there is, then they will be righteous ones." The next day, Foytlin and three others were also arrested. After massive demonstrations over the Dakota Access Pipeline, a number of states made it harder to protest oil and gas pipelines. The state of Louisiana is making its first arrests under these tougher laws as protesters try to stop construction on the new Bayou Bridge Pipeline. Here's Travis Lux of member station WWNO. TRAVIS LUX, BYLINE: Deep in the Atchafalaya Swamp of south Louisiana, twigs snap under the rubber boots of about 40 protesters as they march through shaded woods. Many have tied bandanas around their faces, leaving only their eyes exposed. Ahead, backhoes fling mud as construction workers clear a path for the new Bayou Bridge Pipeline. UNIDENTIFIED PERSON #1: Y'all are trespassing. UNIDENTIFIED PERSON #2: (Unintelligible). Go home. LUX: This is the last leg of the controversial Dakota Access Pipeline. If completed, it'll bring crude oil from North Dakota through Louisiana where it will be exported abroad. The protesters are trying to stop that from happening. But then the sheriff's department shows up. UNIDENTIFIED PERSON #3: Everybody start backing up now. UNIDENTIFIED PERSON #4: Let her go. LUX: A deputy has one woman pinned to the ground. There's a tug of war until she's freed. It's incidents like this that have made lawmakers take action against pipeline protests. Earlier this year, Louisiana State Representative Major Thibaut proposed the stricter penalties. MAJOR THIBAUT: You know, that - there's a right way to do things and a wrong way. If you want to protest against something or - you get your permit and you go do it in a legal fashion. LUX: Trespassing in Louisiana is normally a misdemeanor, but the new law deems oil and gas pipelines to be critical infrastructure. As of August, trespassing near them gets you a felony. Several states have either passed or are considering similar laws, including Oklahoma, Iowa and Pennsylvania. Craig Stevens represents pipeline interests with Grow America's Infrastructure Now. The oil and gas industry is a big part of many states' economies, especially in Louisiana. And he says these new laws will both help ensure pipelines aren't delayed and help keep workers and protesters safe. CRAIG STEVENS: It wasn't too long ago when there were, I think, four protesters that broke through and tried to penetrate - and actually did pierce - a pipeline up in the Midwest. And they used blowtorches. I mean, that type of thing could actually explode and kill somebody. LUX: Pipeline opponents say more than 10 people have been arrested under Louisiana's stricter law. Journalist-activist Karen Savage captured the first arrests on this video. UNIDENTIFIED PERSON #5: Let go. Let go. Let go. Let go. LUX: Security officers pull three protesters onto an airboat from their kayaks. Those arrested said they didn't think they're doing anything illegal because they were on the water, which is considered public property. But now, they face felony charges. BILL QUIGLEY: This is - it's a ridiculous over-criminalization of people who protest. LUX: Bill Quigley is a law professor at Loyola University in New Orleans and represents pipeline protesters here and in other states. He thinks the new law is unconstitutional. QUIGLEY: And that's a real First Amendment problem. LUX: Quigley plans to challenge Louisiana's law in court and hopes that that encourages other states to walk back their own laws. Meanwhile, it's not clear whether the local district attorney will actually prosecute those charged with felonies but they could face up to five years in jail. Anti-pipeline organizer Cherri Foytlin says the protesters won't be deterred. CHERRI FOYTLIN: I hope to God there's no more felonies, but if there is, then they will be righteous ones. LUX: The next day, Foytlin and three others were arrested. For NPR News, I'm Travis Lux in the Atchafalaya swamp. (SOUNDBITE OF ELI CATLIN'S "KINGS HIGHWAY") Transcript provided by NPR, Copyright NPR.